My experience with DJ Land of Castles was fantastic i am a student in Chester university which is a long way away from where they are based but they kindly offered to deliver to us for a small travel fee as we could not find any other suitable inflatable firm around for the castles that we needed. We was setting up a fundraising event for the campus, we ordered the 20x20 gladiator duel which was fantastic fun for the students and teachers, we also ordered the bungee run and the adult sumo suits. They were delivered an hour before confirmed so that there would be enough time get everything sorted. The delivery staff where fantastic and very polite, pick up time was arranged in case the event overran its set finish time. I would definitely recommend DJ land of castles to anybody and will be using them again soon!. We had the peppa pig castle was brilliant the kids had a grate day will defo use them again thanks. 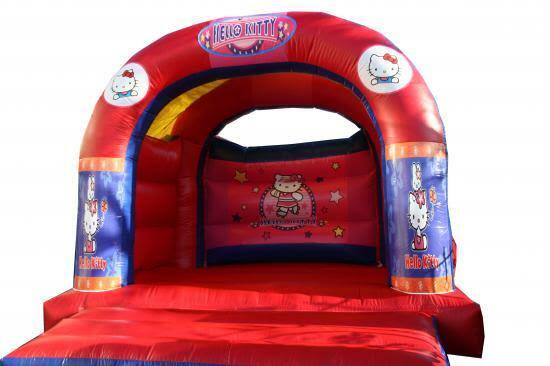 hello kitty bouncy castle hire. Hello Kitty is the Japanese bobtail cat whom first came to appearance 35 years ago. It is now a popular character for most young girls in the country. This themed bouncy castles has a raincover so whatever the weather you can still have fun on our Hello Kitty castle.We deliver our themed bouncy castles, inflatable slides,rodeo bull hire,plus are assault courses and adult bouncy castles and domes,to Merseyside & Liverpool, Widnes, Runcorn, Wirral,Warrington, and St Helens, and some of these areas and further areas will be a additional fuel charge or toll/tunnel charge.Check our delivery checker on our home page,it will tell you if there is a charge for your area.